Perfect Picture Book Friday: What About Moose? Fox met her friends, with her toolbox in hand. She divvied up jobs, and then Moose trotted in. “It takes a team to build a tree house—but what if that team includes one very bossy moose? I’m a big fan of using inexpensive materials for craft projects with young kids…with a paper bag or a paper plate, you can have a barrel of fun! You will need: One paper lunch bag, one piece of construction paper, markers or crayons, scissors, glue. Help your child trace his handprints on a piece of construction paper. Glue at the top of the lunch bag – these are the antlers. Draw moose features with markers or crayons. 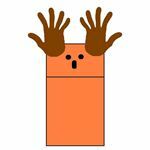 Role play with your child and retell the story – you can take turns being moose. Acting out the story is a great way to develop literacy skills like comprehension and vocabulary. And guess what? I’ve got a special treat in store for you TOMORROW. CO-AUTHOR OF TODAY’S PPBF, WHAT ABOUT MOOSE? Please don’t miss it—she’s got lots to share, including a stellar recipe for gingersnaps! Thank you all for visiting – I look forward to your comments – please share this wonderful book and activity with parents, teachers and librarians – they are always looking for great books and quick & easy activities that educate and entertain. 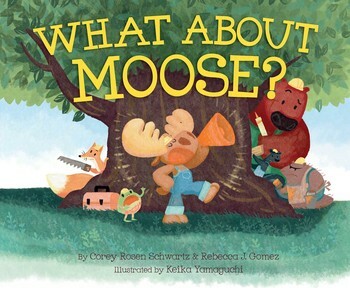 This entry was posted in Perfect Picture Book Friday, Picture Book Review and tagged Corey Rosen Schwartz, Friendship, Rebecca J. Gomez, teamwork, What About Moose? by viviankirkfield. Bookmark the permalink. Thanks Vivian, I really like this book. It is so clever. It’s a great book just for fun, Tracy…with super rhyme…but it’s also a great story about teamwork and friendship. 😉 Glad you liked the puppet activity. You are too kind, Marylin! But a bossy moose book is cool, right? And I think kids would LOVE to role play with the puppet as the bossy moose. How has your summer been going? I know you are probably on the road back and forth a lot. What a great message. You just never know when you’ll run into a bossy kid… I mean moose – who needs to gently learn how to share the load and BE a friend. I m shocked that you ve not seen a moose with a good sense of humor yet! I ve been meaning to check out this book so thanks for the reminder.